It might be the most gorgeous movie of this century...about the last century. Phantom Thread is getting all the award show buzz because it’s a movie for the ages, set in the glamour of 1950’s post-war London, renowned dressmaker Reynolds Woodcock (Daniel Day-Lewis) and his sister Cyril (Lesley Manville) are at the center of British fashion, dressing royalty, movie stars, heiresses, socialites, debutants and dames with the distinct style of The House of Woodcock. It’s one of those films that if there was no volume, the cinematic masterpiece element would suffice. The lush score is as rich with emotion as the art direction’s flawless point of view. In the film, women come and go through Woodcock’s life, providing the confirmed bachelor with inspiration and companionship, until he comes across a young, strong-willed woman, Alma (Vicky Krieps), who soon becomes a fixture in his life as his muse and lover. Once controlled and planned, he finds his carefully tailored life disrupted by love. With his latest film, Paul Thomas Anderson paints an illuminating portrait both of an artist on a creative journey, and the women who keep his world running. 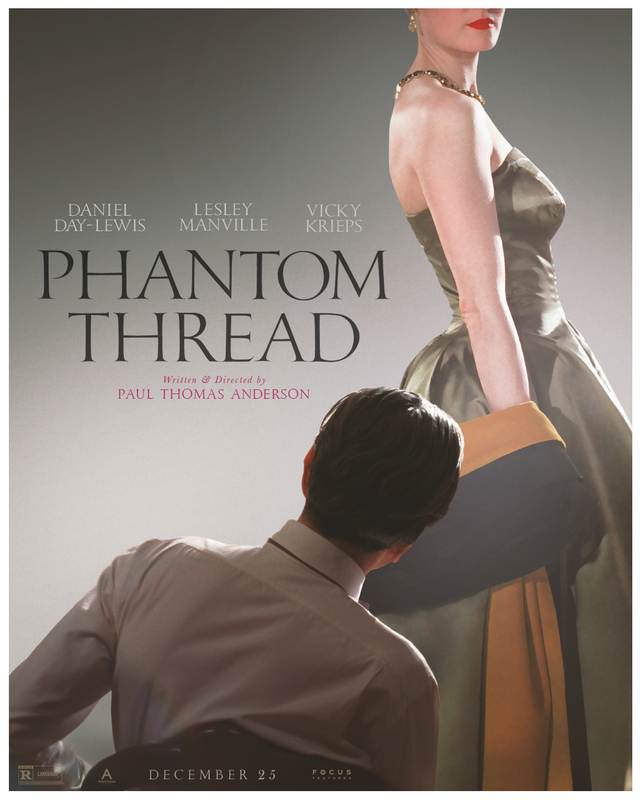 “Phantom Thread” is Paul Thomas Anderson’s eighth movie, and his second collaboration with Daniel Day-Lewis. It’s a must-see for any period film lover.